Like most people at this time of year, I have Christmas carols on the brain. They’re everywhere: malls, supermarkets, non-stop radio stations — it’s hard not to hum a few bars. That’s what I’m doing a lot of, especially with “The Holly and the Ivy.” It’s a moving carol, especially when sung by a choir or by folks dressed up like eskimos. In my head, though, the song sounds something like this: “The holly and the ivy. Hmmm. Hmmm. Hmmm. Hmmm.” I don’t really know the words — and this, my fellow holiday revelers, is the reason for this post. My intention was to locate the lyrics and print them with pictures of, well, holly and ivy. A simple, no-nonsense post — until I began the research and uncovered a complicated history of the carol. To make a long story short, the lyrics are full of controversy and symbolism. Well before Christianity entered the world stage, early peoples honored the winter months by decorating their homes with evergreens, including holly and ivy. In fact, ivy was often associated with the Roman god Bacchus, and holly was part of Saturnalia celebrations. Early Christian leaders tried to change pagan traditions, but they were eventually incorporated into the new religion. As the lyrics evolved, they became symbolic of Christ’s life. They also reflected earlier carols that described the battle of the sexes, with the masculine holly challenging the feminine ivy for supremacy. With very little mention of ivy in the carol, it would seem that holly has won the battle — or is this just another example of the feminine being suppressed by the masculine, which is the basis for a little novel called The DaVinci Code. Like I said, all I really wanted was a simple post. Instead, I have a complicated one, as well as a complicated carol. It’s probably why, now that I think of it, I have a complicated relationship with both of these plants. I love them. I hate them. I love them. Let me first say that we have ivy growing everywhere: spreading along the ground, rambling on and over fencing, climbing up trees. I love its lush appearance and its ability to make a wall of green. But that’s where the love-fest ends. Ivy does not have low maintenance in its vocabulary. It plays a huge role in my gardening life as I hack, prune, and yank it to keep it within bounds as it spreads, rambles, and climbs. And let’s not even talk about the time I had to clean out an ivy-filled area to create a perennial garden. Bah, humbug — indeed! Those were the phrases I grumbled as I stood in 25 degree weather to take these pictures, my fingers numbed around the camera as my two plants looked especially merry and bright. Unlike me, they live for winter. When I thought I couldn’t take any more of the cold, I looked around me. 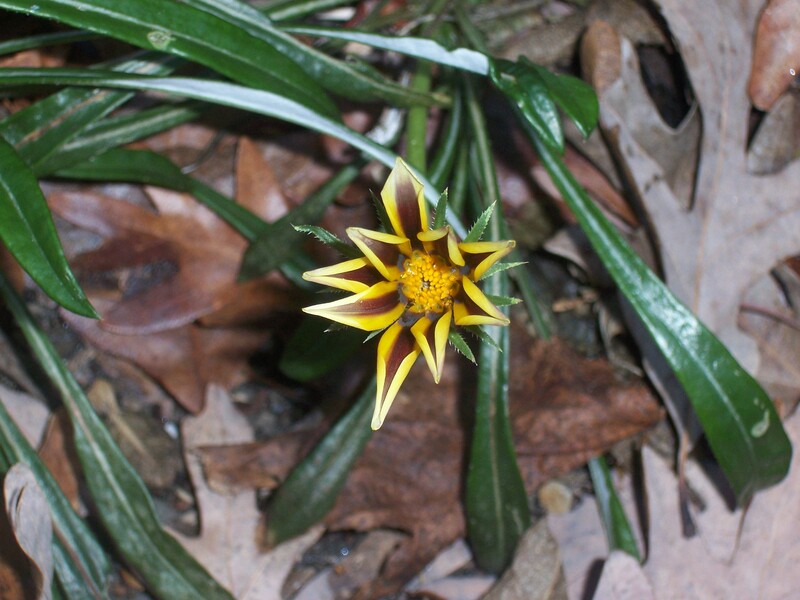 There, nestled among some fallen, frost-tinged leaves was the last Gazania. My very own Christmas miracle — the stuff of which Christmas carols are written. I don’t know this Christmas carol, and you have intrigued me. But I do have both ivy and holly in my garden, and you are absolutely right about both of them. They are both beautiful – and viciously nasty! Love your little Christmas flower. I hope it blooms a long time for you. Hello. By all means, check out the carol. I don’t know how much longer that little Gazania can hold out — not when it has Holly and Ivy (the mean girls) lookig down at it. I totally sympathize. Ivy is a rampant grower that started innocently years ago when the original owner of our house planted a few sprigs here and there. She would be horrified to see its far reaches now. It threatens even more than the notorious kudzu, another foreign invader that has sights on my garden. 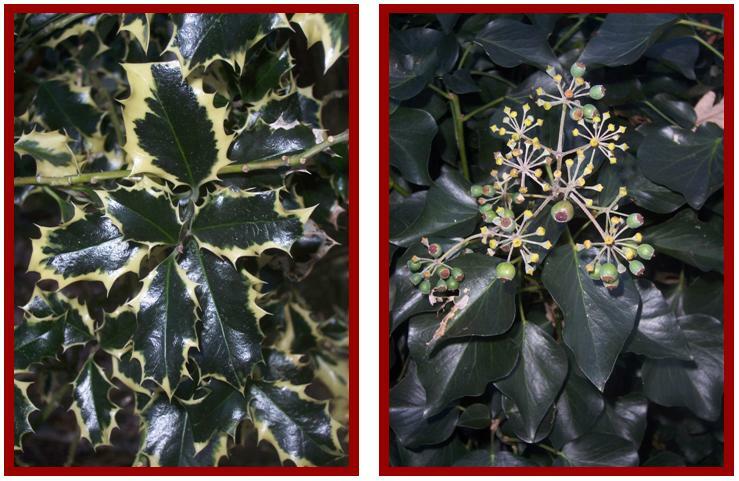 I do think your variegated holly is beautiful! My advice is to wear some thick gloves and long sleeves of sturdy material. I have also enjoyed catching up on your last few posts regarding Christmas trees! I shivered when you mentioned kudzu. That vine is invasive here on Long Island, completely outgrowing — and enshrouding — stretches of woodland. Wishing you the best this holiday season. ‘The Holly & the Ivy…tra…lalala..la..la’ Oh the memories! When I was a wee girl our music teacher at school cruelly decided to make each child sing a solo carol in front of the whole class as part of the assessment of their musical ability. Pooping my frilly school knickers, I volunteered to go first, fearing that I may need several rounds of underwear if was made to wait my turn. So I stood up & for reasons unexplained to mankind I chose ‘The Holly & the Ivy’ with all its crazy high notes. I do recall getting a grade B (which I think was second top) but I’ve been in therapy ever since! As for the plants themselves, well…my neighbour is trying to destroy OUR fence by growing it on their side. We’ve politely asked them to remove it to no avail, we’ve now resorted to chemical warfare but it’s a tough blighter…Grrr! Holly’s just lovely…provided it remains away from my my mitts when tidying. How did I know that of the people who visit this site regularly, you would have a story about “The Holly and the Ivy.” I don’t mean to sound cruel, but I laughed out loud as read of your childhood flashback. It’s also comforting, in a way, to know that neighbor issues are a global. This Christmas, I wish for you a neighbor who is more neighborly. Merry Christmas! I seem to remember hearing part of the story about this carol years ago but I had completely forgotten until reading this. When I lived on the west coast both holly and ivy were the bane of my existence. Ivy is completely invasive and holly reseeded everywhere to the point of being invasive itself. We celebrated Christmas Eve one year by chopping several hollies down. I would never dream of that now living on the east coast where holly seems rather rare. Marguerite, whoever said gardening was all about a peaceful co-existence with nature had never met Ivy or Holly. Despite their “mean girl” status, they do offer a lot to the garden. Enjoy the holiday season. I’ve had a problem with holly ever since I took my first Woody Plants class, which was held in a record cold winter. That class covered hollies (or rather Ilex) and we had to go out every Saturday and tramp around the arboretum learning to tell one from the other. I learned that there are far too many types of hollies and the differences between so many of them are far too few. Cindy, I think that experience would turn me off to Holly forever. If I ever enroll in a Master Gardener class, I’ll try to schedule it in the summer. Enjoy the holidays! I like a bit of paganism myself. I remember singing the carol with gusto when at school. I must have done it often as i can still remember the words! Kevin you could be cutting all that ivy and decorating the house with it for Christmas! Kevin, maybe you’re missing a marketing opportunity. You could do something artistic and sell it to the neighbours or down the market. And you could sing the carol as you do it…. Janet, thanks for the laugh! I can just picture me going door to door — decked in boughs of ivy — fa-la-la-la-la-ing.